Many corporate IT service desks continue to be under pressure to deliver better IT support – with end users and customers demanding increased efficiency and a better service, and likely at a lower cost. Service desks can’t afford to stand still, and thus the improvement of their operations, and of IT support overall, should be a crucial part of any corporate IT organization’s strategy and roadmap. It’s a tough ask though – as, after enduring over a decade of budget cuts, finding ways to improve the service desk might appear difficult, especially when operating with limited funding and people. Stephen Mann is Principal and Content Director at the ITSM-focused industry analyst firm ITSM.tools. Also an independent IT and IT service management marketing content creator, and a frequent blogger, writer, and presenter on the challenges and opportunities for IT service management professionals. This webinar will take a deep dive behind some of the most prevalent emerging technology behind self-service. Items like machine learning, deep learning, natural language processing, chatbots, data mining, predictive analytics, etc. will be explored by the distinguished Dr. Lawrence Hall of the Computer Science and Engineering Department at the University of South Florida. We will also take a close look at some of these technologies as they apply to IT Service Management through real-world use cases. Choosing the right IT service management tool can be tough due to the overcrowded IT market. ITSM vendors provide broad responses to RFP’s, and I & O leaders are struggling to identify the best tools that meet their specific need. These leaders know that a full funnel strategy is required, but have limited insight into the most optimized IT operations to drive business value. Before attempting to adopt ITIL best practices, you have to get buy-in from your executives. How do you do that? Present ROI projections built on sound research! Watch this detailed case study on how to justify and obtain funding for your ITIL project. For a corporate IT organization to create business value, then it needs to focus on things beyond the IT infrastructure, including: understanding customer needs and wants; delivering high quality services, support, and customer service; and effective financial stewardship. ChangeGear Service Smart Technology takes advantage of big data and machine learning to deliver intelligent features that power a new era of ITSM. Intelligent features that augment user interactions and provides predictive analytics and recommendations in real-time based on your organization's historical data, knowledge base, and user interactions. The result is shorter staff training time, faster resolution times, and happier end users. Let’s face it: the goals and vision of IT departments don’t always match up with their corresponding business strategies. This can result in siloed efforts by both parts of the organization, ultimately leading to lost opportunities, missed goals, and unrealized potential. This outcome will likely repeat itself time and time again unless the entire organization can come together to form a unified vision. Join Andrzej Gadomski, ITSM consultant with ESMC, and Adam OBrien, product marketing manager for SunView Software, as they provide 5 simple tactics that your IT department can utilize to sync with organizational goals and run like a fine oiled machine! Andrzej has a passion for teaching and consulting. He has worked in higher education for almost four decades in Europe and Canada, and since 2000, he has been developing expertise in the area of ITSM, linking technology with the business needs of organizations. Andrzej has presented at international conferences in the US, Canada, and Europe, is an active member of itSMF USA, and is the finance director for itSMF Canada. As we move into a new era of ITSM computing, new big data and machine learning tools and methodologies are being developed to support IT staff by intelligently extracting insights and making predictions from the enormous amounts of data accumulated from the organization. According to Gartner, I&O leaders must take a comprehensive approach to incorporate advanced big data and machine learning technologies into their organizations or risk becoming irrelevant. But what exactly is big data and machine learning all about? 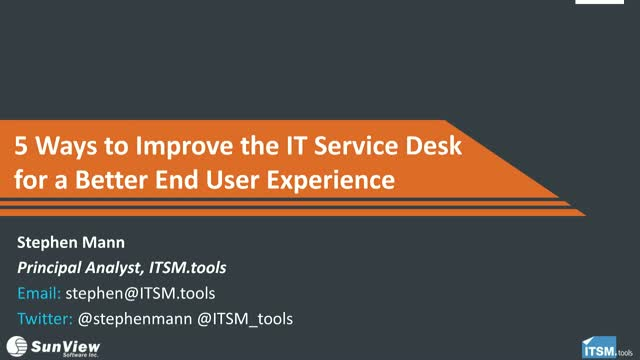 How can you introduce these concepts into your existing Service Desk? Join USF’s distinguished Computer Science and Engineering Professor Lawrence Hall and SunView Software’s VP of Marketing and Product Strategy John Prestridge as they break down the fundamentals of big data and machine learning and provide real-world examples of the impact the technologies will have on ITSM. Lawrence Hall is a Distinguished University Professor of Computer Science and Engineering at University of South Florida. He has authored over 190 publications in journals, conferences, and books. Recent publications appear in Pattern Recognition, IEEE Access, IEEE Transactions on Fuzzy Systems, and the International Conference on Pattern Recognition. Lawrence has received funding from the National Institutes of Health, NASA, DOE, National Science Foundation and others. His research interests lie in distributed machine learning, extreme data mining, bioinformatics, pattern recognition and integrating AI into image processing. Every organization, at one point or another, will need to utilize the capabilities and advantages that a service desk brings, with the end goal being complete satisfaction for end-users while maintaining business SLAs and expectations. Finding the balance between these goals can be challenging for any organization, but with the help of proper strategies and best practices, your business can expect to see immediate returns from your efforts. Join George Spalding, Executive Vice President of Pink Elephant, and Adam OBrien, Product Marketing Manager for SunView Software, as they outline 5 key ways that your organization’s service desk can be optimized to fit the ever expanding needs of the digital enterprise. With DevOps continuing to be adopted by startups & enterprises alike, there needs to be a way to guarantee that the speed and flexibility DevOps provides is supported, and not hindered, by change management standards to ensure the success of modern enterprise. Join Daniel Breston, Chief of DevOps Transformation for Ranger4, and Adam OBrien, Product Marketing Manager for SunView Software, as they review 5 key ideas and strategies on how to integrate your change management platform with your DevOps initiatives. About Daniel: A Texan now living in London, Daniel has over 40 years of experience in IT Operations, ITSM, ALM, SIAM, DevOps, and Lean. Daniel currently serves as Chief of DevOps Transformations for Ranger4, a leading consultancy in business transformation based on technology. Organizations, regardless of size or maturity, will always run into IT related incidents. The trick, however, is to ensure that these incidents cause the least amount of downtime as possible for the customer while avoiding turning into a bigger, company-wide problem. Join Adam O’Brien, Product Marketing Manager for SunView Software, as he examines the basics of ITSM incidents and problems and covers 3 critical strategies that your organization can implement to help minimize the impact that incidents and problems can have on your customers and company. It’s widely thought that the presumably slow, bureaucratic tendencies of ITSM are at odds with the fast paced, agile work flows of the DevOps movement. However, these two sides of IT service management are far more equipped to work in conjunction with each other to help organizations achieve success than most may realize. Join Jayne Groll, President of ITSM Academy, and Adam OBrien, Product Marketing Manager for SunView Software, as they take a look at 5 ways that you can leverage your existing ITSM standards and best practices to help work towards a successful adoption of DevOps cultures and ideologies in your organization. ITSM Academy co-founder and President, Jayne Groll's management certifications including ITIL Expert, ITIL V2 Service Manager (with Distinction), ISO/IEC 20000 Consultant Manager, Microsoft Operations Framework and Certified Process Design Engineer (CPDE). Jayne draws on over 20 years of senior IT Service Management roles across a wide range of industries and domains. Jayne leads content development at ITSM Academy and ensures all courseware and trainers bring similar practical experiences into each of our offerings. She also strategically tracks service management trends, emerging industry practices and certification schemes. Her blog, Jayne Explains, keeps followers apprised of industry events and updates. Jayne is involved in the Service Management community. She also is a founding officer of the South Florida IT Service Management Forum (itSMF USA) and Help Desk Institute (HDI) chapters and served as President of the Accredited Training Council Trade Association (ATCTA). Jayne is a member of the ITIL Qualification Board’s ATO Subgroup. She is a frequent conference, webinar and local interest group speaker. Historically, the viewpoint of change management has typically been that it’s best left for organizations that rely on the established processes and guidelines of ITIL. However, continuous deployment methods and ideologies such as Agile IT, DevOps, and bimodal IT have ushered in a new era of high velocity performance that demand change controls to minimize risk, ensure compliance, and provide total visibility across the entire enterprise. The question begs - Are traditional ITIL-based processes the only true way to effectively implement change management? Or can there be room in the Agile IT world for change tracking and regulatory compliance without becoming a hindrance to speed and productivity? Join George Spalding, EVP, Pink Elephant and Adam O’Brien, Product Marketing Manager, SunView Software as they tackle the tough questions regarding ITIL, DevOps, and change management within an Agile IT environment! George Spalding is the co-author of ITIL® V3’s Continual Service Improvement core volume. George Spalding was recently awarded the 2012 Ron Muns Lifetime Achievement Award from HDI and is one of the world’s most insightful and engaging IT Service Management and Support experts. In addition to his extensive commitment to improving the industry, George spent several years as a consultant to the White House on technical presentations and White House conferences. He also coordinated technical presentations for members of the President's cabinet, the Smithsonian Institute, and the Federal Bureau of Investigation. George is an ITIL Expert, he is a regular author of IT articles and white papers, and is a presenter at global ITSM conferences and events. SunView Software is a leading provider of enterprise IT software that enables companies to better track, manage and control IT service management. The ChangeGear product suite enables companies to gain greater visibility into their IT infrastructure, eliminate system downtime, reduce operational costs and ensure regulatory compliance.